Sri pada season is from December to April each year. Any other period is off season and not many people go there. The weather is not suitable and temple at the top of the mountain is closed and open for few hours during full moon poya days only. Yet, travelling during off season has other virtues. This picture was taken in June this year, which had one of the highest level of rainfall, compared to last few years. 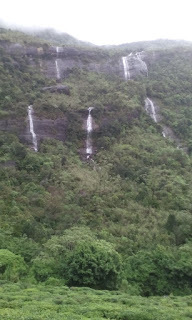 The result is so many waterefalls that you would not see on other times. I saw this anonymous quintuplet on the way to Sri pada just after this bend. How marvelous to see so many waterfalls at once.